Extinction is a real threat for mankind in the Netflix exclusive anime series. Anime fans in the U.S. who grew up watching Gundam Wing on Cartoon Network’s Toonami block will love the darker, more mature take on the mecha subgenre of anime they’ll find with Netflix’s Knights of Sidonia. 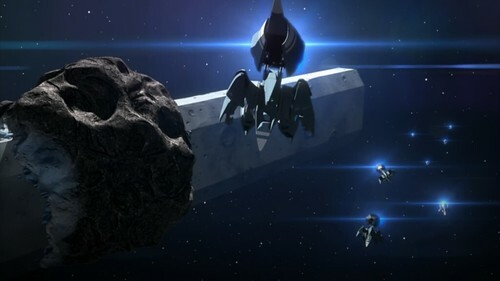 Whereas series like Power Rangers, Voltron, and various Gundam iterations are lighthearted in their tone and small in their stakes, Knights of Sidonia is a dark, post-apocalyptic story of mecha vs. kaiju that feels an awful lot like Battlestar Galactica meets Pacific Rim — and it’s not afraid to depict some truly grisly deaths. In Knights of Sidonia, the year is 3394 and the half-million remaining humans live aboard a massive arc named Sidonia as it hurdles through space. As the series begins, Sidonia has already spent 1,000 years fleeing from the “gauna,” the monstrous shapeshifting alien race that destroyed Earth. A select few “Knights” pilot Gardes, Sidonia’s name for giant mechs. The protagonist, Nagate Tanikaze, grew up hiding “underground” with his grandfather, training daily in a Garde simulation. He emerges from hiding to join a society he never knew, and he eventually becomes one of humanity’s greatest defenders. It’s a job he trained his entire life for, and through his eyes, the viewer slowly learns how truly desperate existence is on Sidonia. “Special humans piloting giant mecha” is a tried-and-true premise for an anime that could very easily be a bore here, but rather than just throw mecha pilots into an endless war with flashy fight scenes, Knights of Sidonia deftly explores the practical implications of its setting. What would humanity really look like after a thousand years aboard a massive space arc? What technologies or innovations would be invented for the sake of survival? How dangerous and gritty would their lives be? Knights of Sidonia has a lot to say about these questions, and so much more. Much like the recently released Blame! 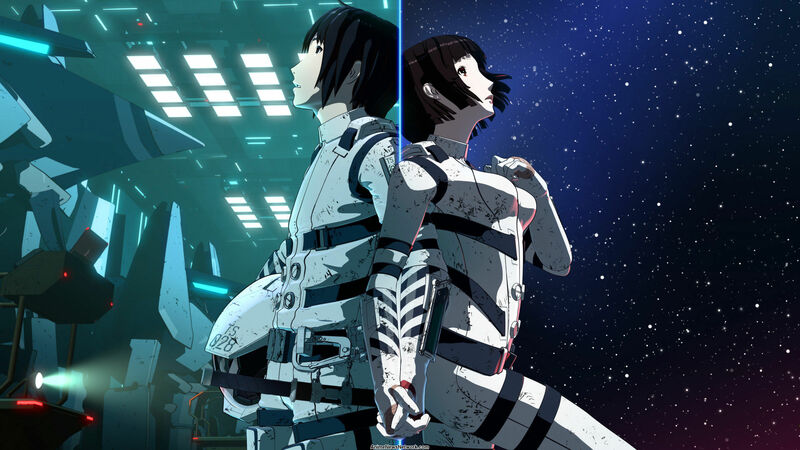 anime film, Knights of Sidonia is adapted from a manga by Tsutomu Nihei and produced by Polygon Pictures. Both anime feature a very similar dystopian sci-fi design aesthetic with 3D character animations. (At times, it’s even implied that both series exists in the same universe.) Whereas many sci-fi anime can come across colorful and refined, both these series make a point of presenting worlds with a uniquely weathered look that conveys how grim and desperate these dystopias really are. Sidonia itself is massive and built into what looks like an asteroid. In Sidonia’s society, innovations like human cloning, asexual reproduction, and human genetic engineering are commonplace, along with an adaptation that allows most humans to gain nutrients via photosynthesis rather than actually eating. And one of the show’s most interesting characters is Izana Shinatose, who is actually a non-binary “third gender.” She has androgynous features and, like all third genders, her body can shift into either male or female when she finds a mate. Starvation might be a concern, but the real threat comes from the Gauna, which are faceless, emotionless, formless blobs that are nearly impossible to kill. Because they’re so grotesquely inhuman, they’re that much more of an absolute terror. Not only are the fight scenes in Knights of Sidonia truly horrifying — even with Gardes, humanity is hopelessly outmatched, and the frequent deaths are truly gruesome — but the despair permeates throughout and beyond the militarized portion of society. Humanity is totally screwed. If you don’t die from a Gauna attack of some kind, then you’ll probably just die of starvation at some point. In this, Knights of Sidonia is a lot like Attack on Titan in space. Knights of Sidonia is easily one of the best anime available on Netflix right now, and you can’t watch it anywhere else. Sure, it’s overwhelmingly dark and gritty, but at least there’s a fun and hilariously cute momma bear that takes care of Nagate. In a dark, spacefaring future, some people cyberize into anthropomorphic momma bears.